"You are the most enthusiastic crowd I’ve ever seen!" says Shane Filan, member of the boy band, Westlife. "You are the most enthusiastic crowd I’ve ever seen!" This was how Shane Filan of the boy band, Westlife, described their Filipino fans who went to the concert last night, September 29, at the Araneta Coliseum in Cubao, Quezon City. PEP.ph (Philippine Entertainment Portal) had a chance to see the Big Dome show—one of the first few stops in the Asian leg of Westlife’s ongoing Gravity Tour. "LET US BRING SOME OLD SONGS BACK." The Big Dome was crammed with cheering fans. Before the band’s much-awaited performance was the front act. Three of Star Magic’s newest talents—Young JV, Van Roxas, and Piero Vergara—regaled the crowd with their RnB, pop and rap renditions. After the prelude, Westlife’s back-up band did a brief sound check while the main stage was spruced up. After a few minutes, band members walked to the stage and were met by loud cheers from the audience. 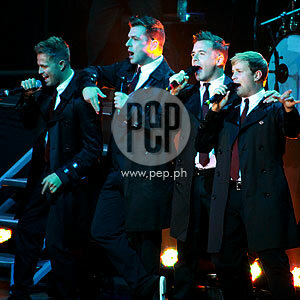 Westlife opened the concert with "When You’re Looking Like That." Fans couldn’t help but sing along with them. This was followed by "World of Our Own," "What Makes A Man," "I Will Keep You Safe," and their cover of "Home," a Michael Bublé original. Then the group changed into casual outfits. Kian Egan, another member of Westlife, greeted the crowd, saying, "Sorry we left you for so long! So, let us bring some old songs back, are you familiar with the song, ’My Love’?" The crowd sang along as the band performed. Then it was Nicky Byrne’s turn to say "hello" to the fans. Once again, he expressed his disappointment over not meeting his "boxing hero" Manny Pacquiao. To get over his frustration, he invited four fans who were holding banners with warm messages from the audience. Some banners read, "Nicky, I want twins, can I have your genes?" and "Kian, is it hot in here, or is it just you?" With the four happy fans on stage, the group performed the song, "Beautiful." In the middle of the performance, someone from the crowd hurled a bra onstage. Quick on the draw, Kian caught it, read something scribbled on it and threw it back to the crowd. The quartet wore outfits which ranged from smart formal to cool casual. At one point, they emerged wearing Mickey Mouse T-shirts, and showed off their well-chiseled bodies. They were brimming with youthful vigor. They also did cover songs like "Speed of Light" by Coldplay, "Only Girl" by Rihanna, and "Bad Romance" by Lady Gaga. As most Westlife fans know, revivals are an integral part of their music catalogue. One of last night’s crowd pleasers was "You Raise Me Up" by Josh Groban, which Mark described as "a very inspiring song that makes me feel like I’m in heaven." They serenaded the crowd with their original hits such as "Seasons in the Sun," "I’m Already There," "I Will Reach You," and "Flying Without Wings." For their finale, the group performed "What About Love." After that performance, their fans chanted, "We want more! We want more!" The group obliged and closed with "Up Town Girl." Although it’s been five years since their last concert here, the indefatigable Irish "man band," (as Shane quipped) still captured the hearts of Filipino fans who packed the Big Dome.